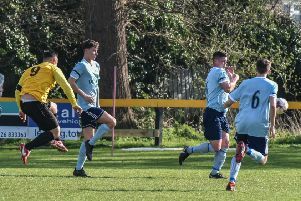 Racing Club Warwick boss Scott Easterlow was delighted with the performances of some of his fringe players in the narrow victory over Littleton last Saturday. Following on from a tough games the previous Tuesday and with one eye on the midweek trip to Heather St Johns, Easterlow opted to shuffle his pack and ultimately felt the decision was justified. “On Saturday we reaped the benefits of the strength in depth of our squad,” he said. “I made six changes from our last league game as I chose to rest some lads in preparation for the Heather game. “I’m pleased for the boys who came in as they were a credit to themselves, especially in the first half when I felt we completely dominated play and restricted a very good side to one half-chance. “Ultimately that first-half performance won us the game. “Second half they came at us and had a more equal share of the ball but they struggled to break us down regularly. In the end, Tuesday’s trip to Heather fell victim to a frozen pitch, further adding to Racers’ fixture pile-up. Nevertheless, Easterlow has still not given up hope of bridging the 16-point gap to frontrunners Walsall Wood. “We know it’s massive ask to catch the leaders but we won’t give up on it until it is impossible. Racing Club have another tough task on Saturday, weather permitting, when they entertain Leicester Road.